Long time ago there lived a great king and two beggars who always stood at the gate of his palace everyday. As the king rode by everyday, the 1st beggar would say 'blessed is he whom the king helps' while the 2nd beggar would say 'blessed is he whom God helps'. The king always felt pleased to hear the praise of the 1st beggar. One evening the king decided to reward the 1st beggar for all the praise; he ordered his baker to bake a cake and wrapped gold inside the cake. The next day as he rode by, he gave the cake to the 1st beggar as he hailed him as usual. The 1st beggar who was in dire need of cash sold the cake to the 2nd beggar at a cheap price. When the 2nd beggar cut open the cake he saw the gold, sold them and became a wealthy man. He did not return back to the kings gate the next day. As the king rode out of his palace the next day, he saw the 1st beggar still begging for money and stopped to ask him if he ate the cake he gave him. The 1st beggar replied and said no sir, I sold it to my friend who was here with me yesterday; I have not seen him today. The king shook his head highly disappointed and confessed silently to himself, " Indeed, Blessed is he Who God helps"
Our God is the all knowing God, HE has not forgotten you. God always does His work just in time. 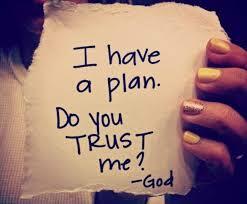 Trust God rather than man.